While many New Yorkers rely on coffee and Pret A Manger to get them through the day, I run on a steady diet of cereal, water, and Westville. Considering the consistent flow of Westville in my bloodstream, it wouldn't be right if we didn't complete the trilogy of Westville reviews. The magic that is the Westville family of recipes all started in a West Village space about the size of a small studio apartment. We can only imagine the copious amounts of weed which was probably smoked as the menu, which has a certain Birkenstock crunch to it, initially came together. Westville's diverse menu of hippie friendly staples, the same at all three locations, would go over just as well in the parking lot scene outside a Phish show as it has here in Manhattan. It's too bad goo-bars aren't one of the dessert options. Despite the lack of space, people still line up every weekend for Chronic Brunch. While Westville's more recent offspring in the East Village and Chelsea feel new and comfortable, the original Westville isn't as fortunate. 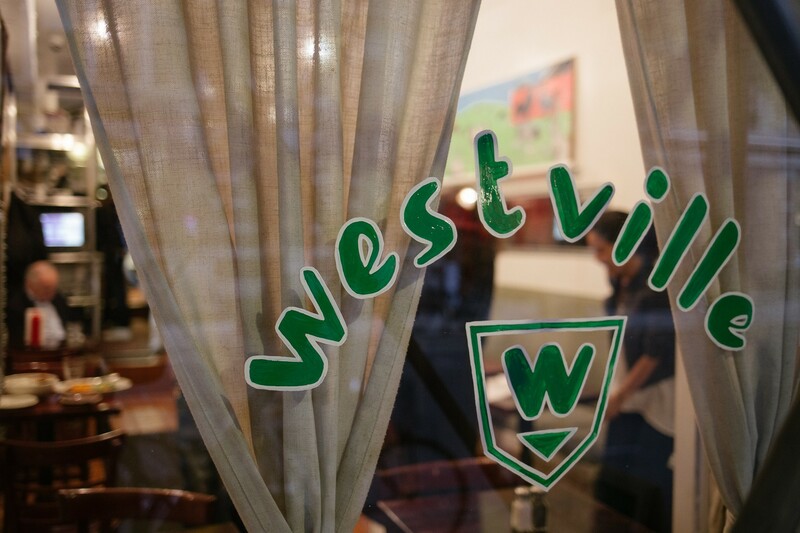 Not to be too blunt, but the original Westville is kind of a sht box. A sht box we love, but a sh*t box none-the-less. While its not exactly an ideal dining scenario, it gets the job done, gets the job done right and is one of the best delivery/Serious Take-Out Operations in this city. The perfect mid-week dinner, it's served in a light and tangy sauce with two sides, and is always cooked perfectly. One of our favorite dishes at Westville. This salmon is served with salad and one market side, which needs to be the garlic mash. People freak out over both the Veggie and Turkey burgers here. That's a little too healthy for our blood, but we're not surprised they're awesome considering they come out of of the same kitchen that cooks up a moist, juicy and all around very well executed beef burger. Be prepared to get a little messy. We're huge into chicken salad, and find that a lot of places cut corners and pay little attention to the details that make chicken salad either incredible or just average. Not at Westville. This is chicken salad done right, with heavy doses of pepper, onions, celery, and lemon. Just what the doctor ordered for Saturday morning hangovers. Westville does good things with brunch. This leaves little to be desired. I always order it because it looks so damn good, but it's a little too dry. There's too much chocolate cookie and not enough cream filling. However, it tastes a lot better cold. Take it home and put it in the fridge for an hour. AWESOME, but apparently not on the menu anymore? What happened? Please bring it back.